I know of at least three local builders who are in Austin this weekend at the North American Handmade Bike Show (NAHBS) showing off their wares: Winter Bicycles, Bronto Bikes, and Co-Motion Cycles. We have plans to do a series on local builders here on WeBikeEugene and have been talking to Eric with Winter about kicking us off with some discussion of the various trade shows he’s headed to this Spring and Summer, as well as talking to us about the business of building bikes. Right by the door at the 2011 NAHBS is a booth showcasing the work of Eric Estlund: Winter Bicycles, based out of Springfield, OR. These bikes are simple. These bikes are streamlined. These bikes are beautiful without being over the top. Each bike conveys a unique essence.This all makes sense, considering that Estlund’s entire building philosophy centers on creating special one-offs unique to the personality, needs, and build of the intended rider. To that end, you’ll never find him ordering a standard tube set for one bike; the downtube may be oversized, while the top tube is classic 1”. You’ll also never find him creating a set “type” of bike. A customer won’t come in wanting a “road frame,” but will discuss with Estlund what sort of qualities he/she wants in a bicycle, as well as its intended uses, and will go from there. The paint jobs by Keith Anderson also reflect this core belief. Take the striking purple touring bike on display. The customer had only one word in mind: plum. 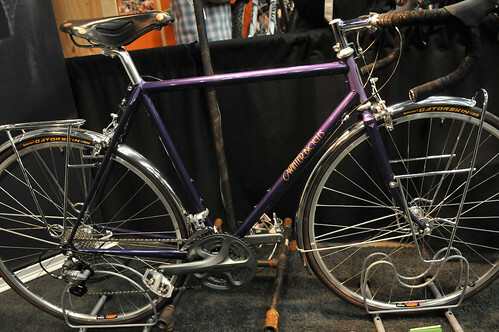 From there, Estlund found a purple hotrod using a web search, and sent it to Anderson, who then mixed a custom color to match as well as choosing an accent color for the headtube. For Winter Bicycles, a build using creative direction rather than a creative directive is a successful build; place the trust in the experts to do what they do. Finally, you can follow Eric directly on his blog. Stay tuned for more on local bike builders. Hi Shane! Thanks for getting this up. I’m back in the shop now- great show, good press and lots of foot traffic. I’m happy to be home and getting my hands dirty! Keep an eye on the blog for continual updates, and keep in touch for more on We Bike Eugene! Thanks, again!